The way an environmental issue is named in a survey may affect the responses given. When it comes to global warming versus climate change, research finds that, among Republicans, the former term invites less certainty in the existence of the phenomenon. Conversely, Democrats’ existence beliefs are not influenced by the label used. These findings by Schuldt, Roh, and Schwarz (2015) replicate results of an earlier study by Schuldt, Konrath, and Schwarz (2011), suggesting that the extent of the partisan divide on the issue might partly depend on the design of the questionnaire, namely, on question wording. In the experiment conducted by Schuldt, Roh, and Schwarz (2015) over 2,000 self-identified Republicans and Democrats were randomly assigned to answer questions about either global warming or climate change (the questions were identical in every respect except for the term used). 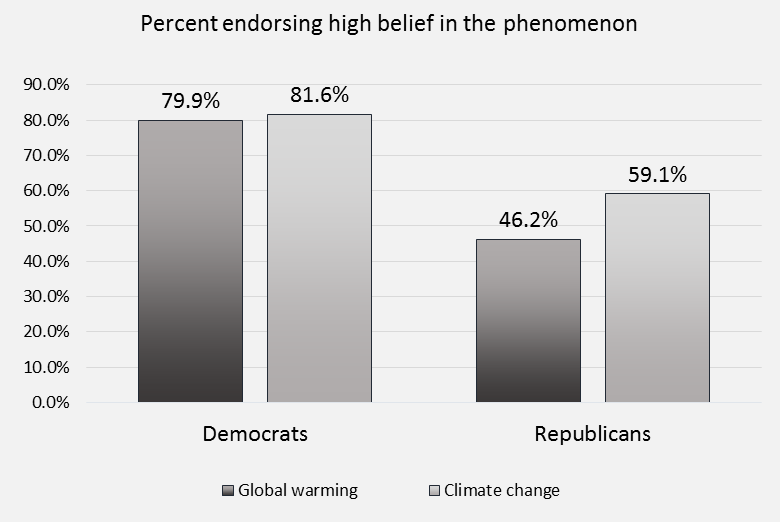 In addition to the effect on personal existence beliefs, labels also influenced perceptions of the degree and direction of scientific consensus on the issue. When answering questions worded in terms of global warming, both Republicans and Democrats were more likely to say that most scientists believe the phenomenon is not occurring or are unsure about whether it is occurring or not. Leiserowitz, A., Feinberg, G., Rosenthal, S., Smith, N., Anderson, A., Roser-Renouf, C., & Maibach, E. (2014). What’s in a name? Global warming vs. climate change. Yale Project on Climate Change Communication, New Haven: CT.
Villar, A., & Krosnick, J. A. (2011). Global warming vs. climate change, taxes vs. prices: Does word choice matter? Climatic Change, 105(1-2), 1–12.